Outdoor recreational activities are increasing worldwide and occur at high frequency especially close to cities. Forests are a natural environment often used for such activities as jogging, hiking, dog walking, mountain biking, or horse riding. The mere presence of people in forests can disturb wildlife, which may perceive humans as potential predators. Many of these activities rely on trails, which intersect an otherwise contiguous habitat and hence impact wildlife habitat. The aim of this study was to separate the effect of the change in vegetation and habitat structure through trails, from the effect of human presence using these trails, on forest bird communities. Therefore we compared the effects of recreational trails on birds in two forests frequently used by recreationists with that in two rarely visited forests. In each forest, we conducted paired point counts to investigate the differences between the avian community close (50 m) and far (120 m) from trails, while accounting for possible habitat differences, and, for imperfect detection, by applying a multi-species N-mixture model. We found that in the disturbed (i.e., high-recreation-level forests) the density of birds and species richness were both reduced at points close to trails when compared to points further away (−13 and −4% respectively), whereas such an effect was not statistically discernible in the forests with a low-recreation-level. Additionally we found indications that the effects of human presence varied depending on the traits of the species. These findings imply that the mere presence of humans can negatively affect the forest bird community along trails. Visitor guidance is an effective conservation measure to reduce the negative impacts of recreationists. In addition, prevention of trail construction in undeveloped natural habitats would reduce human access, and thus disturbance, most efficiently. Recreational activities in nature have increased enormously in the last decades (Boyle and Samson, 1985; Steven et al., 2011; Monz et al., 2013; Steven and Castley, 2013; Hammitt et al., 2015). This trend is raising concerns of researchers and conservationists about the potential impact of human recreation on wild animals. Humans are often perceived as potential predators by wildlife (Frid and Dill, 2002). Thus, when exposed to human presence, animals may react with important changes in their behavior and physiology (e.g., increased vigilance, flight, release of stress hormones (Ikuta and Blumstein, 2003; Beale and Monaghan, 2004a,b; Tablado and Jenni, 2017), which in turn might have consequences for individual fitness and the dynamics of animal populations. Apart from these direct impacts, indirect effects, mainly through loss or alteration of habitat, also affect wildlife. Many outdoor activities rely on some kind of infrastructure with trails and roads being the most common ones. Trail/road construction often engenders habitat loss, alters vegetation, modifies soil surface and alters water balance (Benninger-Truax et al., 1992; Trombulak and Frissell, 2000). Moreover, roads may also increase habitat fragmentation: they dissect larger expanses of habitat into smaller pieces, separate wildlife populations and inhibit gene flow (Saunders et al., 1991; Reed et al., 1996; Forman and Alexander, 1998; Bregman et al., 2014). Many studies have therefore aimed at assessing the effects of outdoor recreational activities on wildlife (Steidl and Powell, 2006; Steven et al., 2011; Gutzwiller et al., 2017). Effects of trails, mainly through generating edge habitat, have been substantially investigated (Marini et al., 1995; Dale et al., 2000; Flaspohler et al., 2001) as well as considering the effect of the mere presence of humans, in or outside protected areas (Müllner et al., 2004; Arlettaz et al., 2007; Martin and Réale, 2008; Kangas et al., 2010; Rösner et al., 2014; Bötsch et al., 2017; Baker and Leberg, 2018). Studies investigating trail effects on birds found inconsistent results, with some studies showing an effect of trails while others do not (Gutzwiller et al., 1998; Miller et al., 1998; Deluca and King, 2014; Thompson, 2015). One reason for such an ambiguity about possible effects of trails could be the difficulty to disentangle the direct effect of human presence from the indirect effect of habitat modification caused by the installation of trails and roads, which entails a less dense vegetation or even the clearance of it in most habitats (Miller et al., 1998; Miller and Hobbs, 2000; Smith-Castro and Rodewald, 2010; Butler et al., 2012; Morelli et al., 2015). In order to disentangle the effects of human presence from habitat modifications through trails we examined how breeding-bird communities changed with distance to trails in forests similar in size and structure, but widely different in levels of recreation. We predicted that the differences between bird communities close and far from trails will be higher in forests experiencing high recreational levels than in forests experiencing low recreational levels. That is, in high-recreation forests we expected lower densities and richness of breeding birds close to the trails than further away, while this difference would not exist or be much smaller in low-recreation forests. Additionally, we expected to find inter-specific differences in the impact of trails according to species characteristics, since habitat clearance and/or human presence are likely to affect bird species differently according to their nesting and foraging habits and sensitivity to humans (Blumstein et al., 2003; Langston et al., 2007; Mallord et al., 2007; Kangas et al., 2010; Thompson, 2015). For statistical inference we used a novel multi-species, or community, N-mixture model (Yamaura et al., 2012; Kéry and Royle, 2016) to rigorously tease apart abundance and detection error, while fully accommodating the split-plot design of our study. We conducted our study in four different forests. Two of them (Allschwilerwald (47°32′N, 7°32′E) and Sihlwald (47°15′N, 8°33′E) in Switzerland) were close (< 2 km) to cities with more than 150,000 inhabitants each (Basel and Zurich, respectively), and hence heavily used by humans for recreation. The other two forests (Forêt de Chaux (47°05′N, 05°40′E) in France, and Laufenwald (47°26′N, 7°26′E), in Switzerland) were much less frequently used (>8 km from towns with about 25,000 inhabitants). This classification of the forests into high and low levels of recreation through the proximity to cities was confirmed by own observations during fieldwork: in the Forêt de Chaux and Laufenwald we observed, on average, no more than one human pass per day, while there were 15–25 and 5–15 visitors per hour in the Allschwilerwald and the Sihlwald, respectively (own unpublished data). Our estimates of visitor frequency in the Allschwilerwald and the Sihlwald were confirmed by local specialists (pers. communication B. Baur and R. Schmidt). In most cases recreationists were walking on the trails (sometimes accompanied by dogs), but sometimes they were jogging and biking. All four forests were broad-leafed, mature and had a closed canopy. Pedunculate oaks (Quercus robur) and/or European beech (Fagus sylvatica) were the dominating tree species in these forests with some admixed European hornbeam (Carpinus betulus), sycamore maple (Acer pseudoplatanus), European ash (Fraxinus excelsior) and scarcely some conifer trees (Picea abies, Abies alba, Pinus sylvestris, Pseudotsuga menziesii). The four study sites contained a well-developed network of gravel roads and trails (hereafter collectively called ‘trails') which were freely accessible to the public for recreation (e.g., walking, biking), but where cars and motorbikes were prohibited for the general public. To assess the avian community near and far from trails we used classical point count surveys (Bibby et al., 2000) in a nested and paired design (Figure 1) in 2 years (2013 and 2015). We surveyed birds at 37 pairs of points within forests with a high recreational level (Allschwilerwald 8 pairs of plots and Sihlwald 29 pairs), and at 25 pairs of points in forests with a low recreational level (Forêt de Chaux 12 pairs and Laufenwald 13 pairs). Within each pair, we placed one point close (at 50 m) to a trail and the other point further away at an average distance of 120 m (range 70–160 m from the trail; placing them spatially separated, to make sure that points did not overlap (centroids were at least 100 m apart) or end up close to other neighboring trails Figure 1). The location of the points was chosen from aerial photos, with the criterion of placing both points of a pair within a homogenous forest patch (see below). Thus, our experimental design was a three-level split-plot (Steel and Torrie, 1980; Mead, 1990), with points blocked in pairs and pairs of points nested within forests, and where one treatment (disturbance level of a forest) was “applied” at the forest level, while the other (distance to trail) was “applied” at the bottom level of the design. Figure 1. 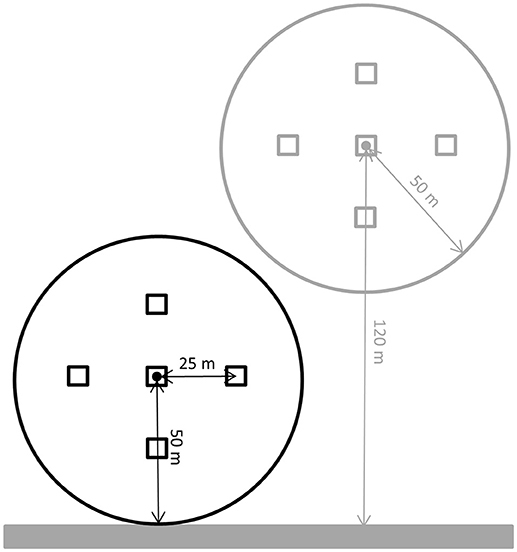 Schematic representation of a pair of points for surveying birds within a radius[-108mm] Q5 of 50 m (circles). The gray bar represents a trail. The black and gray circles represent the surveyed area of the point close and far from the trail, respectively. Squares (five in each point count circle) show the locations where the vegetation surveys took place. The middle point is the spot from which the bird (point count) survey was performed. During each point count, a single observer recorded all birds heard or seen within 50 m during 6 min (i.e., we conducted fixed radius point counts). A point count radius of 50 m was deemed appropriate for these forests, as most birds could still be visually located and therefore easily assessed whether being within the radius or outside. For the analysis of the number of territories within 50 m (= territory density per point count) we used only observations of birds showing territorial behavior (e.g., singing). To avoid including in our counts singing long-distance migrants that were still on migration, we used species-specific threshold dates (arrival dates from Schmid et al., 1998; see Table S1) before which we discarded any observation of a species. We used range finders (Nikon Prostaff 7 monocular or Zeiss Victory 10x45 T* RF) to check whether observations were inside or outside of the 50 m radius. Points were surveyed twice in the Allschwilerwald and Sihlwald in 2013 (first occasion 30 May−18 June, second occasion 26 June−17 July), and on three occasions in all four forests in 2015 (first 18 March−18 April, second 18 April−31 Mai, and third occasion 11 May−17 June). Due to time constraints, we could only monitor 14 of the 29 pairs of points in the Sihlwald in 2015. All point counts were conducted by the same two observers: YB in 2013 and DS in 2015. To account for possible researcher-related flushing effects (while walking to the point center), the order in which points within a pair were approached and surveyed was switched between survey occasions. In addition, we similarly switched the order in which the pairs within a forest were surveyed to randomize potential effects of time of day. Point count surveys were conducted in the early morning, starting right after sunrise [i.e., between 05:21 and 09:45 Central European Time (CET), (Bibby et al., 2000)]. This means that most survey work was done before the bulk of recreationists arrived (R. Schmidt Unpublished Data). In both years we recorded the vegetation to account for differences in habitat composition among points. Surveys were done at five different locations around each point (one at the point-count spot itself and four at locations 25 m away from it into the four main cardinal directions, to be able to characterize the vegetation structure of the entire surveyed area around each point; Figure 1). At each location, we estimated ground vegetation cover (%) on a 2 × 2 m area, shrub cover (%) on a 3 × 3 m area (i.e., vegetation with diameter at breast height (dbh) of less than 5 cm, otherwise counted as trees) and canopy cover (%) by looking straight up and assessing the proportion of canopy against the sky in the visual field of the observer (same observers as for the point counts). Additionally we counted the trees on an 8 × 8 m area per species (beech, oak and conifers), including standing dead trees (deadwood). The vegetation surveys were conducted after the point-count censuses, when the vegetation was fully developed (end of May until September). For each vegetation variable, we averaged the vegetation measures of the five locations within each point before analysis. These vegetation variables showed that overall the vegetation characteristics (ground-, shrub- and canopy-cover and number of trees per species) did not differ substantially between far and close points neither in heavily frequented nor rarely frequented forests (see Figures S1, S2). For inference about both abundance and species richness we used a novel split-plot variant of a multispecies, or community, N-mixture model (Yamaura et al., 2012), a multispecies generalization of the original binomial N-mixture model of Royle (2004), where we separately estimated detection probability and abundance and could relate both to covariates which may describe the blocking structure and the treatment structure of an experiment as well as covariates. See Chapter 11 in Kéry and Royle (2016) for a thorough description of this class of models. What is new in our application is the blocking structure in the split-plot experiment: the nesting of the observational units induces a correlation structure, which we had to accommodate in our analysis. We organized our point count data in a 4d array Ci, j, k, t, which contains the count obtained at site i = point count location (i = 1…124) during occasion j (j = 1…3) for species k (k = 1…42) in year t (t = 1, 2). Only two counts were conducted in year 1 (2013) in two of the woods and none in the other two and counts were missing in about half of the sites in Sihlwald in year 2, hence we filled in the array with missing values (NA) to retain balance. Thus, we assumed that abundance Ni, k, t at site i of species k in year t was a Poisson random variable governed by expected abundance λ, which was similarly indexed by i, k and t and thus was allowed to vary by site, species and year, but not by occasion j. The absence of an index j shows that this model makes the closure assumption: that the true abundance of a species at a site and during a given year remains constant. The first line in the above model describes the true abundance, which is latent, i.e., only partly observed due to measurement error. The second line specifies the measurement error process, i.e., the imperfect ‘mapping' of the true abundance N to its measurement C. We made the conventional assumption that there were only false-negative errors (i.e., individuals overlooked), but no false-positive errors (i.e., no double counts), and hence, a natural measurement error model is the binomial distribution where p can be interpreted as the detection probability of an individual. Here, β0, k is an intercept, βwood, v(i), k the effect of wood v (v = 1.0.4), βpair, w(i), k the effect of the point count pair w (w = 1.0.62), βyear, k is the effect of the second year (2015), and βcov, k, rXi, t, r is the regression model for covariate Xr (r = 1.0.7). The covariates are organized in a 3d array, because they vary by point i and year t and there are seven of them [ground cover, shrub cover, canopy cover, mean number of beech-, oak-, conifer-trees, and dead-trees (deadwood)]. These vegetation covariates did not show strong correlations among each other (Pearson correlation coefficient < 0.6). Finally, the last three terms code for the treatment structure of the experiment which is described in terms of the two (binary) indicator variables Xdisturbance and Xdistance which code for the second level of the factors Disturbance and Distance, such that Xdisturbance = 1 denotes woods with much disturbance and Xdistance = 1 sites close to trails. The terms βwood, v(i), k and βpair, w(i), k describe the blocking structure in the experiment and account for the expected similarity of sites within the same wood and pair, respectively. We coded these blocking terms as nested Normal random effects as in Qian and Shen (2007) and Li et al. (2017). Note that all parameters are also indexed by k for species, showing them to be different for every species. We treated them as random effects by assuming Normal distributions for every set of them, with a mean and a variance estimated from the data. These hyperparameters formally describe the entire community from which the observed species are assumed to form a random sample. Here, α0, k is an intercept, αyear, k is the effect of year 2015, and the following two terms code for an interaction between forest disturbance class (where a value of X of 1 denotes a disturbed and one of 0 an undisturbed forest) and the time of day of the survey (minutes elapsed since sunrise), to control for potential differences in singing activity depending on recreation intensity (Gutzwiller et al., 1994; Frid and Dill, 2002) and the final two terms code for a linear and quadratic effect of the date of survey (incorporating the seasonal and daily variation in singing-activity). As for the abundance submodel, all parameters are also indexed by k for species and we gave each such set of parameters its own distribution with hyperparameters that were estimated, i.e., all species-level parameters were again treated as random effects with a Normal distribution. We chose a Bayesian analysis of the model and implemented it in the BUGS language (Lunn et al., 2009) in program JAGS (Plummer, 2003). For all parameters, we chose prior distributions meant to be vague, see BUGS code in the Supplementary Material for details. A model for all 42 observed species crashed always, but we succeeded in getting the model to run when we restricted the analysis to those 36 species with more than a single observed occurrence (see Table S1). For inference, we ran two chains of length 1,000,000 with a burnin of 500,000 and thinned by 1 in 250, leaving us with a sample of size 4000 of the joint posterior distribution. Based on values of the Brooks-Gelman-Rubin statistic of less than 1.1, this was sufficient to reach chain convergence for all parameters except for the abundance and detection intercepts for one species which had Rhat values of 1.27 and 1.13, which we deemed to be inconsequential. We based all inferences about abundance in relation to the distance × disturbance treatments on the estimates of Ni, k, t, which we averaged over the two years and then aggregated over sites i or species k by summing or averaging as needed to compare the sites belonging to the four treatment groups or species in different guild groups (see next paragraph). Thus, totals or means of site- or species-level abundances were computed as derived quantities from the estimates of Ni, k, t. The beauty of an MCMC-based Bayesian analysis is that the estimation uncertainty in N is fully propagated into these derived quantities, allowing us to make probability statements about whether different treatment groups or estimates for guilds differed from one another. In order to explore differences in response to trails according to species properties, we investigated three guilds in more details (nesting guilds, foraging guilds and sensitivity toward humans). The nesting-guilds included cavity-, ground- and open-cup nesters, according to Perrins and Cramp (1998), the foraging-guilds were classified as ground vs. above-ground feeders according to Perrins and Cramp (1998) and the sensitivity toward humans was classified into high or low. In order to define sensitivity toward humans we used the species' mean flight initiation distance (FID) (low sensitivity = FID lower than the median FID for all our species vs. high sensitivity = FID equal or larger than the median FID; FID data from Møller (2008) and Díaz et al. (2013) for non-urban areas; see Table S1). We acknowledge that FID may be modulated by many factors (Tablado and Jenni, 2017), but is still a reasonable and widely available proxy for sensitivity to human disturbance (Blumstein et al., 2003). For the analyses of species richness, we exploited the fact that there is a direct, deterministic relationship between the abundance of the species in a community and community species richness: species richness is simply the sum of species with non-zero abundance (Kéry and Royle, 2016). Hence, we reduced the posterior samples for the 3d array of abundances, Ni, k, t, into an array for presence/absence zi, k, t, where z = 1 denotes an abundance greater than zero and z = 0 an abundance equal to zero. Then, by simply aggregating this estimate of species-specific presence/absence zi, k, t we conducted the analogous comparisons between sites (for treatment groups) and guilds (for species groups) as we did for the abundance analysis. Again, using all 4000 samples from the joint posterior distribution of zi, k, t permitted full error propagation into all estimated quantities as well as inference about the “significance” of the difference between two quantities, which we took to be the case that the posterior difference of two quantities did not contain zero. A preliminary analysis, including also trail-type, revealed, that there was no difference in effect of gravel roads vs. trails (Figure S3). Therefore we removed trail-type as variable from further analyses. All analyses were conducted in JAGS (Plummer, 2003) and R version 3.3.0 (Ihaka and Gentleman, 1996; R Core Team, 2016) and using the package jagsUI (Kellner, 2017) for linking R and JAGS. For calculating the 95% credible intervals (CrI) of the model estimates (see also Figure S4) and the pairwise differences (with 95% CrI) between close and far points in the number of territories and species (Figures 2, 3) we used the highest probability density interval-function (HPDInterval-function from the R-package coda; (Plummer et al., 2006). Significance is thus assessed via credible intervals not overlapping with zero. To facilitate model convergence all numeric explanatory variables were centered and standardized (mean = 0, sd = 1). Figure 2. Differences (mean ± 95% CrI) in the fitted number of territories (A) and species (B) between paired point-counts close to and far from trails in forests with low or high levels of recreation. Negative values indicate more territories or species far from trails. The dotted line (zero) represents an equal number of territories or species at both distances from the trail. Credible intervals that do not overlap the zero line represent a difference that is “significant” in a Bayesian analog to a significance test. Figure 3. Differences (±95% CrI) in the estimated average number of territories (pooling all species within a group) between points close and far from trails in forests with high and low levels of recreation, according to (A,B) nesting-guild, (C,D) foraging-guild, and (E,F) sensitivity toward humans. See Figure 2 for further explanations about how to read the figure. As a detection-ignorant (i.e., observed) measure of the abundance at a point, we computed the mean of the maximum counts at a site, which ranged between 0.01 and 2.24 (mean 0.43) for the 36 analyzed species. However, the average detection probability estimate under the N-mixture model (i.e., the back transformed detection intercept α0, k) ranged from 0.09 to 0.15 (mean 0.10) and hence, the estimates of the average expected abundance (i.e., the back transformed abundance intercept β0, k) ranged from 0.09 to 1.45. In forests with a high level of recreation, the number of territories at points close to trails was 12.6% lower than at paired points further away (86 vs. 98 territories on average), while in forests with a low level of recreation no difference between points close to and far from trails was noticeable (100 vs. 103 on average) (Figure 2A). 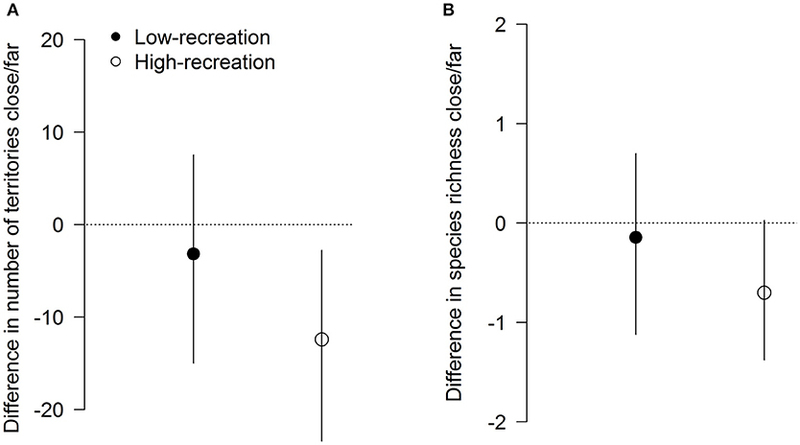 Similarly, we found a reduction of 4.0% for species richness (16.8 species vs. 17.5 on average) at points close to trails compared to far points in forests with a high level of recreation, which was not observed in forests with low levels of recreation (18 species in both on average) (Figure 2B). Additionally, at the level of the community (i.e., for the hyperparameters), we found a quadratic effect of Julian date on detection probability of territories. That is, breeding-bird territories were more detectable in the middle of the season compared to either the early or late spring, which reflects the general singing phenology of breeding birds. Furthermore, and again at the community level, there was a tendency for the number of oaks to positively affect the number of territories (0.027, with a posterior probability of 82%), while the number of beeches negatively affected the number of territories and species richness (−0.049 with a posterior probability of 95%). Cavity, ground, and open-cup nesters had lower numbers of territories and species close to trails compared to paired points further away in forests with high levels of recreation (Figures 3A,B, Figures S4A,B). This effect was not observed in forests with low levels of recreation, where proximity to trails seems to only slightly decrease bird presence independent of the nesting guilds (Figures 3A,B, Figures S4A,B). The foraging-guild specific analysis revealed no differences in numbers of territories or species between close and far points in forests with low levels of recreation, whereas in forests with a high level of recreation, above-ground foragers, and to a lesser extent also ground foragers, showed a reduction in number of territories and species close to trails compared to further away (Figures 3C,D, Figures S4C,D). Concerning sensitivity to humans, we found that in forests with high levels of recreation both high- and low-sensitivity species showed lower numbers of territories, and to a certain extent also of species, close to vs. far from trails. In forests with a low level of recreation, however, we only observed a slight tendency for lower numbers of territories close to trails in highly sensitive species (Figures 3E,F, Figures S4E,F). In this study, we were able to separate the effect of human presence from that of trail-associated habitat modifications by investigating the response of the avian community to trails with different levels of recreation. We showed that the disturbance caused by recreation activities (mostly walking) reduced forest bird density by 13% and species richness by 4% and that this effect was not merely due to the habitat modification associated with the presence of trails. This agrees with an experimental study with humans walking off-trail in a forest in France where it was observed that humans per se, without habitat modification, negatively impact the bird community (Bötsch et al., 2017). Habitat modifications resulting from trail construction may have a positive or negative effect depending on the bird species (Morelli et al., 2014). We found no negative influence of trails on the number of birds and species richness dependent of the nesting guild (Figures 3A,B) for low-recreation forests, whereas there was an overall negative effect in forests with a high level of recreation. Ground nesters showed the least severe effect, which could be explained by the fact that forest clearing for trail construction allows the development of a rich understory at the edges, which in turn can serve as refuge and nest cover for ground nesters (Virkkala, 1987; Trzcinski et al., 1999; Šálek et al., 2010). Unfortunately, our vegetation measures were not taken close enough to the trail edge to directly confirm this hypothesis (with only one vegetation measure at 25 m from the edge and the rest farther away; Figure 1 and section Materials and Methods), although there is a tendency to more ground vegetation close to the trail (see Figure S1). Note also that potential vegetation changes due to human trampling are only expected to be important on trails and areas edging trails and, therefore, trampling would not cause major decreases of understory vegetation at points close to the trails compared to the far points (see Figures S1 for confirmation). Thus, trampling is not likely to be a major driver of bird reductions near trails. The importance of habitat in driving avian community is further confirmed in our analyses by the overall positive effect of oaks, which coincides with previous studies which show that oaks are determinants of forest biodiversity (Caprio et al., 2009). The impact of recreational trails also varied according to other species characteristics, such as foraging guild and sensitivity to humans. Surprisingly, we did not find a stronger effect of recreational trails on ground foragers when compared to above ground foragers as we expected after Thompson (2015). This could be due to the overall low number of ground foragers found in these forests or the higher availability of food along the trail edge for certain species (Šálek et al., 2010; Batáry et al., 2014). Highly sensitive species (large FID) tend to avoid areas close to trails even in forests with low levels of recreation, while low-sensitivity species seem to be negatively affected by trail presence only in highly frequented forests. Therefore sensitivity, approximated by FID, could be used to help designing future conservation measures through management of tourist numbers and access (Blumstein, 2003; Blumstein et al., 2005; Fernández-Juricic et al., 2005; Koch and Paton, 2014; Bötsch et al., 2018). To account for imperfect detection, we adopted a novel formulation of a community N-mixture model (Royle, 2004; Yamaura et al., 2012), where we accounted for the split-plot experimental design by specifying multiple, nested levels in the abundance model as did Qian and Shen (2007) and Li et al. (2017) in the context of a different class of models, traditional mixed models. We believe that a nested data structure in point counts and other animal abundance estimation protocols is more widespread than generally recognized and hence, we believe that our application of a split-plot design in the context of an N-mixture model may be much more widely interesting. Our analysis is not spatially explicit (Chandler and Andrew Royle, 2013) and hence, even though we took great care to determine whether each detected bird was inside or out of the 50m radius of our point counts, we have no formal way of assigning an area to our abundance estimates. The reason for that is the presence of territories at the edge of our plots, which extend the effective survey area beyond the limits of the nominal survey area. This carries over to the interpretation of our abundance estimates from the N-mixture model, which strictly has to be interpreted as the number of individuals that occur within some unknown distance from the point at which the surveyor stood. This distance is always greater than 50 m, and much more so for species with larger territories (e.g., the Common Buzzard Buteo buteo) than for species with small territories (e.g., the Goldcrest Regulus regulus). Therefore, there is a sense in which our abundance estimates ought to be interpreted as a detection-corrected index of density at our survey points. The fact that the effective sampling areas around our points will extend beyond the nominal sampling limit of 50 m also means that for some species at least, they will overlap somewhat between the two paired points (and very much so for some species with very large territories such as the Common Buzzard). We don't think that this is a problem in our analysis, since the ensuing dependence will be taken account of in the random pair effects in our analysis. Actually, it will make our comparison between the far and near trail treatments conservative by slightly blurring their differences. In conclusion, by comparing the response of the bird community to trails in high-recreation vs. low-recreation forests, we observed that human presence per se causes important disturbance to birds in recreational areas and that the overall effect of recreational trails depends mainly on recreation intensity and only slightly on species characteristics. Moreover, the fact that we found a negative effect of recreationists on the avifauna of forests which have been used for recreation for decades suggests that habituation to humans has not been able to outweigh the negative impact of human disturbance (Bötsch et al., 2018). Our findings have also some additional implications. Firstly, census and monitoring schemes which are often done from roads and trails (Hanowski and Niemi, 1995; Sutter et al., 2000; Sauer et al., 2013) should take into account the species' responses to habitat alterations and the level of recreation on trails in order to interpret the census results adequately. Secondly, our results provide further evidence that the impact of recreation could be reduced by limiting the access of visitors to certain areas (protected areas) and encouraging visitors to stay on trails elsewhere (Miller et al., 2001; Reed and Merenlender, 2008; Coppes and Braunisch, 2013). Enough undisturbed wildlife habitat (quiet zones) away from trails not only benefits birds, but also mammals (Taylor and Knight, 2003; George and Crooks, 2006; Reed and Merenlender, 2008). As recreation activities are mainly bound to trails, reducing the network of trails would limit human access to natural areas most efficiently. If new recreational trails or roads have to be constructed, a well-designed plan is crucial, which incorporates habitat and spatial requirements of the different species (e.g. sensitivity to humans or fragmentation; Andrén, 1994; Reed et al., 1996; Forman and Alexander, 1998; Rodríguez-Prieto et al., 2014), considers renaturation of unused trails (e.g., harvesting roads) and takes into account the possibility that new trails facilitate access of new predators (Miller and Hobbs, 2000). In summary, this study supports that trails and roads can considerably affect bird community composition and abundance, not only by modifying habitat along trails, but mainly through their use by recreationists. We had for all forests, if necessary, the permits to access those. Through the point count surveys no animals were harmed, although reflecting a short time disturbance event. These short time disturbance events do not differ from a potential outdoor recreationist walking through the forest. YB, ZT, DS, RG, and LJ designed the study. YB and DS collected the data and together with MK and ZT analyzed it. YB, ZT, DS, MK, RG, and LJ wrote the manuscript. All authors contributed to manuscript revision, read and approved the submitted version. This study was funded by the Swiss Ornithological Institute. We thank all the foresters or managers, who allowed us to access their woods: Ch. Stauffer and R. Schmidt of the Sihlwald and M. Romanski and J-L. Dessolin of the Forêt de Chaux. Bruno Baur gave helpful information on the Allschwilerwald. Bibby, C. J., Burgess, N. D., Hill, D. A., and Mustoe, S. H. (2000). Bird Census Techniques. London: Academic Press. Boyle, S. A., and Samson, F. B. (1985). Effects of nonconsumptive recreation on wildlife: a review. Wildl. Soc. Bull. 13, 110–116. Hammitt, W. E., Cole, D. N., and Monz, C. A. (2015). Wildland Recreation: Ecology and Management. Chichester: John Wiley & Sons. Hanowski, J. M., and Niemi, G. J. (1995). A comparison of on- and off-road bird counts: do you need to go off road to count birds accurately? J. Field Ornithol. 66, 469–483. Kellner, K. (2017). jagsUI: A Wrapper Around “rjags” to Streamline “JAGS” Analyses. Kéry, M., and Royle, J. A. (2016). Applied Hierarchical Modeling in Ecology: Analysis of Distribution, Abundance and Species Richness in R and BUGS: vol. 1: Prelude and Static Models. London: Elsevier/Academic Press. Mead, R. (1990). The Design of Experiments: Statistical Principles for Practical Applications. Cambridge, UK: Cambridge University Press. Miller, S. G., Knight, R. L., and Miller, C. K. (2001). Wildlife responses to pedestrians and dogs. Wildl. Soc. Bull. 29, 124–132. Perrins, C., and Cramp, S. (1998). The Complete Birds of the Western Palearctic on CD-ROM. Oxford: Oxford University Press. Plummer, M. (2003). “JAGS: a program for analysis of Bayesian graphical models using Gibbs sampling,” in Proceedings of the 3rd International Workshop on Distributed Statistical Computing. Schmid, H., Luder, R., Naef-Daenzer, B., Graf, R., and Zbinden, N. (1998). Schweizer Brutvogelatlas. Verbreitung der Brutvögel in der Schweiz und im Fürstentum Liechtenstein 1993–1996. Sempach: Schweizerische Vogelwarte. Steel, R. G. D., and Torrie, J. H. (1980). Principles and Procedures of Statistics: a Biometrical Approach. New York, NY: McGraw-Hill. Steidl, R. J., and Powell, B. F. (2006). Assessing the Effects of Human Activities on Wildlife. The George Wright Forum. Virkkala, R. (1987). Effects of forest management on birds breeding in northern Finland. Ann. Zool. Fenn. 24, 281–294. Copyright © 2018 Bötsch, Tablado, Scherl, Kéry, Graf and Jenni. This is an open-access article distributed under the terms of the Creative Commons Attribution License (CC BY). The use, distribution or reproduction in other forums is permitted, provided the original author(s) and the copyright owner(s) are credited and that the original publication in this journal is cited, in accordance with accepted academic practice. No use, distribution or reproduction is permitted which does not comply with these terms.